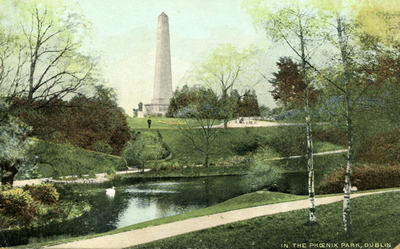 This painted photo of Dublin's Phoenix Park is identified as B. & R's "Camera" Series No. 592 -- British Manufacture. Inland postage was 1/2d. and foreign was 1d. The monument in the center is the Wellington Testimonial, a 205-foot obelisk commemorating the victories of the Duke of Wellington in the Napoleonic wars. Phoenix Park itself is best known to history buffs for the Phoenix Park Murders: "the assassination in 1882 of the second and third in rank in the British Dublin Castle government of Ireland by the "Irish National Invincibles.'" I thought for a second that said 'Wellington Testicle' but realized that must have been misidentified. Phallically I mean.